The design for the new reversible USB interface - the standardised connection for data transfers between electronic devices - has been finished. It means users will no longer have to worry which way round the part is facing when plugging it into a device. The new USB Type-C is small enough for mobiles but "robust enough for laptops and tablets", its designers said. But the new USB cables will not connect into the current ports that are found on millions of devices. Specifications are now finalised but the rollout will take time as matching ports are included in new devices. Pictures of renderings of the new USB were first posted online by tech websites such as Cnet. The group developing the next generation of USB cable and connector consists of Hewlett-Packard, Intel, Microsoft, Renesas, STMicroelectronics and Texas Instruments. The agreed exact specifications have been passed back to the non-profit USB Implementers Forum. "Interest in the USB Type-C connector has not only been global, but cross-industry as well," said Brad Saunders, the USB 3.0 Promoter Group's chairman. "This specification is the culmination of an extensive, co-operative effort among industry leaders to standardise the next generation USB connector as a long-lasting, robust solution." 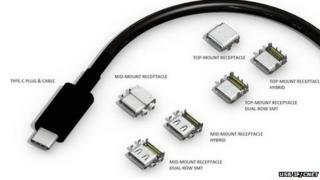 "In addition to the trend of smaller and more mobile devices driving reduced connector sizes, customers expect ease of use, excellent performance, and high reliability in connectivity solutions," said Tom Bonola, who works for HP and is part of the USB 3.0 Promoter Group. The new reversible USB is similar to Apple's Lightning cable, which is reversible and has been standard in all of its iOS phones and tablets since 2012. The first USB cables were released in the mid-1990s and, until now, could only be plugged in one way to ensure a data connection.